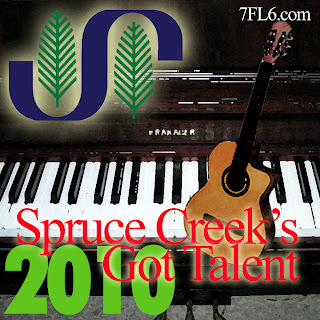 SPRUCE CREEK, FL - The 2010 Annual "Spruce Creek's Got Talent" will be held Saturday and Sunday starting this January 30th, 2010. Due to popular demand there were not enough seats to accommodate everyone so the organizers decided to plan an encore performance the next day. Nicole Bravo - Piano performance of The Corpse Bride by Danny Elfman. 6:00-7:30 Dinner: Chicken Casserole with brandy cream sauce topped with puff pastry. This dish was prepared by the Club's chef at the 4 star Regent Mayfair Hotel. Members and performers and their families can make reservations for dinner on either night. All others can make reservations for Sunday night or be on a waiting list for Saturday night. The cost to members is $22 plus tax and gratuity. The cost to non-members is $27 plus tax and gratuity and must be paid when making their reservations by cash or check. The posts on this site are provided “AS IS” with no warranties, and confer no rights. The opinions expressed herein are solely personal opinions. None of the charts, maps, weather reports and other information are to be used for navigation or flight planning purposes. This site displays information provided by third parties and we are not reponsible for the accuracy or reliability of such information. This independent site is not associated with the Spruce Creek Property Owner's Association.